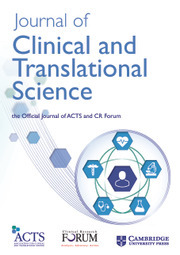 The mission of the Journal of Clinical and Translational Science (JCTS) is to provide a forum for disseminating advances in clinical and translational science. JCTS is a fully Open Access journal publishing high-quality articles on research that spans the translational continuum, as well as education research that informs the development of the translational workforce. Topics of interest include investigations into how to best develop processes and people that translate discoveries into improved health. The Association of Clinical and Translational Science has partnered with the Clinical Research Forum (CRF) to support the growth and development of JCTS. The Journal's founding Editor is Arthur M. Feldman, MD, PhD. The journal's cover image is inspired by the National Institutes of Health National Center for Advancing Translational Sciences’ Translational Science Spectrum.